The use of zoning to protect water quality represents the "second generation" of water quality regulation in the United States. The original regulatory thrust was the reduction of "point source" pollution, such as direct discharges from factories and sewage treatment plants into waterways. These discharges were responsible for the appalling condition of most American rivers and lakes in the first half of the 20th Century. As the Clean Water Act brought point source discharges under control in the 1970s and '80s, the worst pollution was cleaned up. Attention has increasingly turned to the problem of "non-point source" pollution, primarily stormwater run-off from surfaces such as roofs, parking lots, roads, farm fields, and lawns. Because non-point pollution comes from almost everywhere, it cannot be regulated in the same way as point sources, which have a limited number of defined places where the pollutants originate. Regulating land use practices near streams can significantly reduce the run-off of sediment and other pollutants into water bodies. But conventional zoning, which divides a jurisdiction into zoning districts and establishes use and dimensional regulations for each district, can actually contribute to the problem of non-point pollution by ignoring the impacts of nearby development. For example, if a lot has a stream running through the rear yard, a large minimum front setback (required under the zoning district regulations) might force a building to be located very close to that stream, resulting in possible degradation to its water quality. 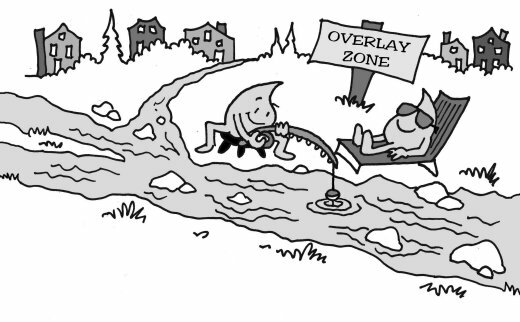 By creating a system of "overlay zones" that cross conventional zoning district boundaries and protect stream corridors, lakeshores, and watersheds, it is possible to maintain and improve the water quality -- even as the community becomes more developed. A water protection overlay zone is a special kind of zoning district designed to protect a stream corridor, lake, or watershed. 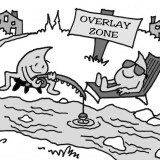 It "overlays" existing zoning districts and adds additional requirements to the underlying district zoning, which remains in effect except to the extent the overlay zone provisions specifically modify it. An overlay zone protects water quality by setting additional standards for development and by incorporating site-specific review procedures. ... the article goes on to discuss steps involved in developing an overlay zone, and provides an overview of non-zoning approaches.